This item was introduced in E-Prime 1.x (Service Pack 1). If E-Prime would happen to exit unexpectedly before a paradigm is saved, the entire paradigm could be lost. 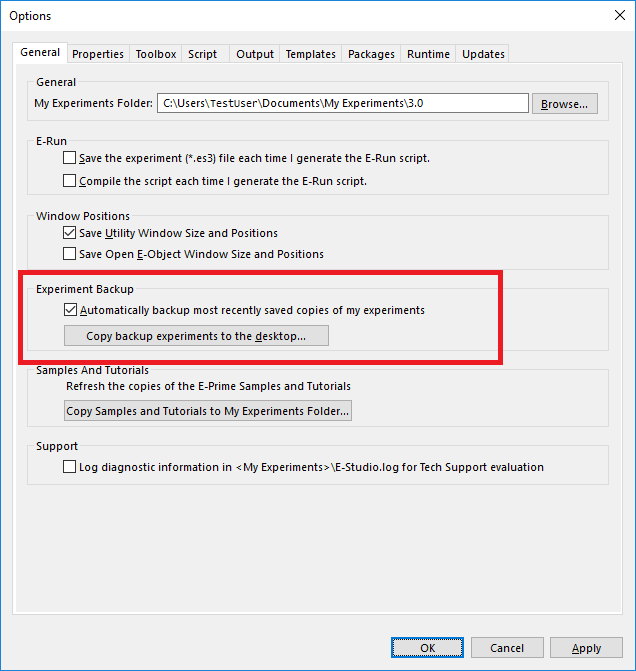 However, E-Studio provides a feature that automatically backs up the current version of the experiment prior to it being saved. This backup goes into the user specific backup queue for all experiments which provides access to the last 25 saved files. The backup queue is located at C:\Users\[User Name]\AppData\Roaming\Pst\E-Prime\E-Studio Experiment Backups. Experiment backups are done behind the scenes and are enabled by default. The General Options property page in E-Studio has an option to enable/disable this feature. Additionally, it provides the ability to transfer the most recently saved backups to the desktop. The experiments are copied to the desktop when the "Copy backup experiments to the desktop" option is clicked. Once on the desktop, users can open each backup experiment and "save as" the version they choose.